A new version of Minecraft was announced today by Mojang. Version 1.8.4 fixes a few minor bugs, and one very large and embarrassing security vulnerability in the Minecraft server. The JDRGaming Minecraft server is now running version 1.8.4, and the Minecraft page on this site has been updated with the latest information. Due to a router change, the IP address of all JDRGaming game servers has changed to 96.49.181.168. Sorry for any inconvenience this may cause. Apparently version 1.8.3 of Minecraft was released on February 20 to address a crashing bug. There was no proper announcement for this update. A couple of lines were added to the version 1.8.2 announcement on the Mojang blog, but this meant that there was no corresponding RSS update. The JDRGaming Minecraft server is now running version 1.8.3. The Minecraft page on this site has been updated with all the latest information. The server hosting the JDRGaming game servers has experienced a major hard drive failure and is down until the failed drive can be replaced. I expect to have the server itself up and running later today, but the game servers may not be up until Sunday. I apologize for any inconvenience. Update: The server (and all three game servers running on it) are back up as of 10:33am, March 7. Mojang has released a new version of Minecraft, 1.8.2. New frame time graph in debug screen. Activated by pressing Alt+F3 to display frame time bar chart in lower left of screen. Spectator Mode: Mobs no longer follow/attack you in spectator mode. TNT: Reverted explosion physic changes to those before the 14w31a snapshot. Explosion force is no longer directionally biased. Oak and Dark oak trees: Oak and Dark oak branches no longer replace blocks. Beacons: Now ignore bedrock above them when determining a clear view to the sky. Mobs: Ocelots now spawn at or above sea level, rather than at Y=63. Squids now spawn below sea level, rather than at Y=63. Carrot on a Stick: Crafting one now removes all enchantments from the original fishing rod. A rather massive list of bugfixes! The Minecraft page on this site has been updated with the latest information. The JDRGaming server has been updated to version 1.8.2. Minecraft 1.8.1 fixes 116 bugs and improves performance. Options - Renamed "Multiplayer Settings" to "Chat Settings". Off/fancy/fast clouds. Off/on entity shadows. Fast/fancy now only controls leaves and rain particles. The main Minecraft page on this site has been updated with information about version 1.8.1. The JDRGaming Minecraft server will be updated to version 1.8.1 shortly. Minecraft 1.8 was released to the general public today. The new version fixes a ton of bugs, and adds numerous new block types (including several special blocks), new mobs, new mob behaviour, a spectator game mode, new stats, new server rules, and much more. Client performance has been improved, as has the server list. You can find all the details about the new version on the Mojang blog, the Minecraft forum, and the Minecraft Tumblr page. Your client should update itself to the latest version automatically. The JDRGaming Minecraft server will be updated to the new version later today. The Minecraft page will be updated at the same time. The JDRGaming Minecraft server is now running the latest version, 1.7.10. All of the changes in the new version are related to Realms, so there's nothing of interest for anyone playing on the JDRGaming server. All JDRGaming game servers will be down this morning for up to an hour, starting immediately (6:45am PST). Things will hopefully be back up and running normally by 8am PST. UPDATE 2014Jun22 8:29am PST: having problems with the router. Still hoping to have things back up within the next few hours. UPDATE 2014Jun22 2:15pm PST: Had to replace the router. Things should be basically working again, but the server IP address changed, from 24.86.121.160 to 96.49.173.236. I've created a Twitter account for status updates for all JDRGaming systems. My plan is to use this account to provide basic information regarding status changes to JDRGaming game servers and related services. Tweets will include planned and unplanned outages, version updates, and so on. 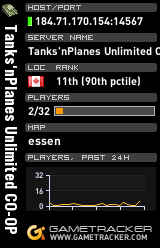 This site hosts a variety of gaming resources, most notably in relation to the Battlefield 1942 server, Tanks 'n Planes Unlimited (TPU). How often should the TPU stats be reset? Should the TPU maps be shorter? No, they're fine as they are. Some of them should be shorter, including Wake and Midway. I pay for TPU's hardware and jdrgaming.com hosting out of my own pocket (with help from some awesome friends). It's not a lot of money, but donations are appreciated! We use Free DNS for dynamic DNS services.